Corheinne Joyce B. Colendres Managing Editor Fate Emerald M. Colobong Issues Editor Mark Joseph B. Fernandez Faces Editor Reyanne Louisse Ampong Culture Editor Corheinne Joyce B. Colendres Letters Editor Kristela Danielle S. Boo Photography Editor Danea Patricia T. Vilog Art Director Luis Miguel B. Arucan, Joahna Lei E. Casilao, Angel B. Dukha III, Gillian Patricia Geronimo, Cris Eugene T. Gianan, Ma. Leandrea A.Tamares Scenes Halee Andrea B. Alcaraz, Ana Gabrielle Ceguera, Micholo Andrei Gabriel I. Cucio, Peach Arianna P. Manos, Alyssa Mae S. Rafael Issues Rommel Bong R. Fuertes Jr., Joy Therese C. Gomez, Syrah Vivien J. Inocencio, Lorraine B. Lazaro, Mary Nicole P. Miranda Faces Angela A. Chua, Christine Janine T. Cortez, Alisha Danielle M. Gregorio, Dominique Nathanielle M. Muli, Theriz Lizel R. Silvano Culture Ian Jozel N. Jerez, Isabell Andrea M. Pine, Maria Pamela S. Reyes, Lorraine C. Suarez, Ryan Piolo U. Veluz Letters Ian Carlo L. Arias, Marlou Joseph Bon-ao, Shana Angela S. Cervania, Karl Patrick R. Marcos, Jose Jaime Raphael Taganas Photographers and Videographer Katrina Nova O. Buyco, Arrienne Jan A. Enriquez, Yanni Kaye A. Wingarts Artists Prof. Michael Anthony C. Vasco, Ph.D. Dean The Flame, the official student publication of the University of Santo Tomas Faculty of Arts and Letters, aims to promote a scholarly attitude among Artlets and Thomasians in the analysis of the implications of current relevant issues to their lives and society at large, to serve as a forum not only between Artlets and the administration but most importantly, among Artlets themselves, and to provide a vehicle for the publication of in-depth articles on the concerns and interests of the Faculty. 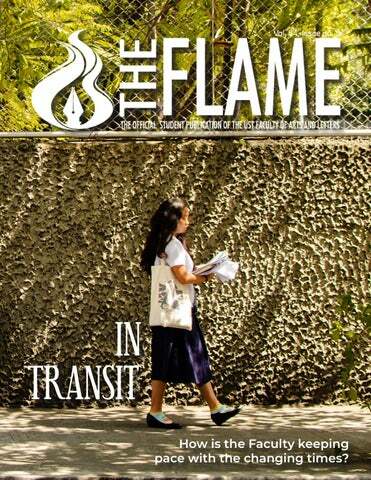 Nothing appearing in the Flame may be reprinted either in whole or in part without written permission addressed to the Editor in Chief of the Flame, G/F St. Raymundâ&#x20AC;&#x2122;s Bldg., University of Santo Tomas, Manila or to editorialboard@abtheflame.net. ÂŠ 2019 by the Flame. ALL RIGHTS RESERVED. 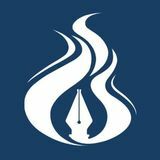 For real-time updates on this year's ABSC general elections, like us on Facebook and follow us on Twitter (abtheflame) and visit us at www.abtheflame.net. HE ANNUAL Faculty of Arts and Letters (AB) parade was a “success” for fulfilling its function despite only being attended by four societies and suffering a delay, Artlets Student Council (ABSC) Secretary Pauline Bartolo said. The Filipino fantaserye-themed parade, which marked the beginning of the annual AB Week festivities, was joined by students from Asian studies (ASN), behavioral science (BES), communication arts (CA), and legal management (LM). “[W]e can see naman na nag-enjoy pa rin naman ‘yung students and na-accomplish pa rin natin [‘yung goal] na to present sa UST community na AB Week is starting,” Bartolo said. CA freshman Gab Jopillo believed the parade had “a lot of potential” despite its lack of preparation. “I think, honestly, it lacked a bit more preparation but the people seemed pretty excited about it. [...] Personally, I like seeing all the different AB courses [and] AB students get together as one. [...] It’s all unifying,” he said. The parade-goers gathered at the Grandstand after circling the campus grounds to present their performances as part of the program. BES was declared champion while LM and ASN were first and second runner-ups, respectively. LM won Best in Costume with their combat outfits depicting the TV series Lobo. CONOMICS (Econ) ended Communication Arts’ (CA) win streak in the men’s basketball tournament of the annual Athena Cup after defeating the two-time defending champion, 104-99, while Political Science (PolSci) swept CA in the mixed volleyball tournament. Econ and CA exchanged baskets before five lead exchanges in the first quarter resulted in a deadlock at 17 points. CA then took control of the ballgame with a 12-3 run, 20-29. Econ tried to close the gap, ending the first quarter at 23-31. CA’s offensive and defensive rebounds gave them a 15-point lead in the second quarter, but an 8-2 run allowed Econ to cut the deficit by seven points and close the quarter at 44-51. Econ’s consistent shooting coupled with CA's poor overall defense allowed them to keep the score close. This led to CA's downfall on top of a threepointer from Juan Miguel Florencio that resulted in a deadlock at 97 points. With one minute and 20 seconds left in the game, Florencio released another three-pointer and gave Econ the lead for the first time in the quarter, 100-97. Florencio then secured the win with 11 seconds remaining after nailing three out of four free throws, ending the game. Florencio led Econ’s offense with 57 points while Kristian Joshua Baluyot and Franz Gio Medrano both added 16 points each. “[L]ast year, natalo kami noong championship. Ang sarap sa pakiramdam na nakabawi rin kami sa kanila. Pero kaibigan din namin sila, so masarap lang sa pakiramdam,” Team Captain Charles Rhoan Subido told the Flame. Econ defeated Philosophy in the semifinals with a nine-point lead, 69-60, securing their spot in the finals, while their triumph over History and PolSci in the eliminations round allowed them to advance to the semis. PolSci bagged the mixed volleyball championship after beating CA in a four-set game, 19-25, 25-10, 25-17, and 25-22. CA gained momentum early in the first set when PolSci made a series of errors that gave CA a six-point lead over them, 8-14. A 4-0 run allowed CA to take the first set. pa lang and then nagkaroon na rin tayo ng social media handles na magiging platform para mas maging interactive siya with other students,” JournSoc President Franchesca Viernes told the Flame. Journalism program coordinator Felipe Salvosa II said the focus of the website is “our community” and encouraged each partner school to actively participate in the initiative. At a forum held during the website launch, seasoned journalists urged journalism students to master the basics of their craft and acknowledge the importance of research to the profession. Philippine Star Malacañang reporter Alexis Romero reminded the aspiring journalists that there is also creativity in news writing. OCIOLOGY STUDENTS are escaping the four corners of the classroom through their own website and Padayon, their e-newsletter which aims to let readers view issues from a sociological perspective. Pioneered by the UST Sociological Society (USTSS), the website is a platform for sociology majors to voice out opinions on social issues and practice personal talents. USTSS Public Relations Officer Yyann Barcelona told the Flame that the website was just an idea that came up over coffee with the 2015 executive board and backed up by the suggestion of a professor. “[S]inuggest sa’min no’ng dati naming professor, si Mark Ignacio, na ‘[Bumuo] tayo ng editorial, like ‘yung official e-newsletter ng [Sociology].’ Tapos naisip namin, ‘pag binuo ba namin ‘to pa’no ‘yung magiging proseso,” he said. “Unang-una, hindi namin kaya magpublish na ‘yung like newspaper kasi siyempre nagsisimula pa lang kami. So ang naisip namin, ‘What if buhayin natin ‘yung website tapos doon natin ilagay?’” Barcelona added. Deejae Dumlao, the website’s layout artist, clarified that the website is not a news outlet but a platform for the society to announce their events. It is also where their Padayon e-newsletter can be found. He echoed Barcelona’s statement on the benefit of the website to sociology students, which is to serve as a platform for discussing their stances on certain issues as well as share the society’s diverse skills. “We just want to really express ourselves not just [in] reflection papers, reaction papers […] Let’s say ‘yung sa pagbaba ng age sa pagkulong, […] gusto namin magkaroon ng opinion on that […] pero more on the sociological lens para ma-apply din namin ‘yung teachings na naibigay sa’min,” he explained. N an effort to meet the standards for higher education institutions, the University of Santo Tomas (UST) is geared toward providing quality education and promoting excellence in different fields and disciplines. The Commission on Higher Education (CHED) recognized these efforts and gave prestigious seals of Center of Excellence (COE) and Center of Development (COD) to 24 programs of UST. In 2015, UST received the highest number of accredited academic programs among private institutions. Four of these programs were from the Faculty. The philosophy program was recognized as a COE, while the literature, journalism, and communication arts programs were accredited as CODs. These recognitions are a good indication of the quality of the programs. However, not all disciplines acquired this status. What are the challenges in achieving the CHEDâ&#x20AC;&#x2122;s accreditation? has 15 units or 15 hours a week of teaching, UST has a full-time load of 21 units. “[Faculty members] are usually bogged down by the teaching loads because it is really quite difficult to do research when you are teaching seven classes. Mahirap ‘yun talaga,” Asst. Prof. Chuckberry Pascual said. Prof. Camilla Vizconde, chairperson of the Department of English, echoed the same sentiment on the difficulty of having both teaching and research loads. “It’s really hard to balance the preparation for teaching with so much loads and the number of research. […] So if you’re going to have 15 units for teaching and you only have 6 units for research, there’s not enough time to do especially the data gathering,” she explained. Aside from classroom work, professors need to prepare for their lessons, check requirements, and allot some of their time for leisure and other activities. There are also professors who have administrative positions that require spending office time on campus, thus taking away some time for teaching and doing research. “Having more time is of course always better. Kasi on top of [the] research agenda of the department, we also have to contend, of course, with our faculty duties, ‘di ba? Parang kailangan mo pang mag-mentor. Kailangan mo ring magturo and be part of different committees,” Pascual said. However, Vasco said faculty members have the choice to deload teaching units and replace them with research units instead. There are also some faculty members who do research of their own accord. “If there are faculty members who [are] not given a research load or aral loads producing research, despite the absence of [research loads], the more that those with research loads would be able to produce research, hindi ba?” Vasco said. The good thing is meron nang strong element na conscious na ang mga faculty to do research. That is the reason why, if you see the profile of the faculty, year in [and] year out, pataas nang pataas 'yung dami ng faculty members na nagiging faculty researchers. research, there are more research centers [...] There’s a lot more space, a lot more slots that have yet to be filled up by research,” Salvosa said. Full-time faculty members who are affiliated with UST research centers are deloaded of teaching units. In the case of Pascual, he was deloaded 12 teaching units, which means he would not teach four classes, but in exchange, produce research output at the end of the year and get compensated for it. However, there are still higher demands for the departments to produce quality research outputs. Ideally, every department in AB should have its own journal to foster research—13 academic journals for the 13 disciplines. But sustainability and the quality of publication are put into question. “We do not want to have a journal per department because the question of sustainability will be the big problem. […] Magsimula ka ngayon, after 2 years wala nang issue,” Vasco said. He also pointed out that there was a need to recognize the fact that the academic advancement of each department varies because some departments started their research agenda earlier than others. ONE are the days when lecturers and professors can execute their individual teaching strategies without students having a say on it. The University requires that, for excellent education to be achieved, it has to listen to its indispensable stakeholders—the students—through a “comprehensive” faculty evaluation. However, as the students evaluate their teachers’ performances every semester, they have not been convinced with the effectivity of the faculty evaluation in improving the professors’ pedagogies; faculty members themselves are divided on whether or not the evaluation process yields any change. sure na tinuturo ay maayos and na may natutunan sila everytime they get out of the classroom,” he said. to its students as it allows educators to improve their pedagogical approaches. “I think it’s not just for the Faculty of Arts and Letters (AB) but for any institution, especially an educational institution, feedback is an important component,” Asst. Prof. Camilla Vizconde, chairperson of the English department said. This is because feedback provides “centric responses” on the implementation of different curricula and strategies, as well as teachers’ capacities in ensuring high-grade education, she added. Having a low evaluation grade has possible repercussions, Tabirara and some department chairs told the Flame. It is the program coordinators who give the evaluation results to the professors. When there are concerns or problems that need to be addressed, the dean calls for a face-to-face meeting with the teacher together with the department chair to discuss the evaluation results. The result, which implies a measure of the competency and abilities of a teacher, also determines whether or not an instructor on probation or a part-time faculty member will be rehired. Placido said that in her several years in the Faculty, during which time she served as one of the administrators and a member of the Faculty Council that oversees the teachers, there have already been various cases where a teacher was not rehired because of a low evaluation grade. “The University is very particular to put a professor or the teacher in the probationary. We have to see at least three or four years of their student evaluation. If they will be safe, they will be recommended for a probationary or tenureship,” she said. If a teacher is on probation, his or her three to four years of teaching will be monitored through the results of evaluations. On the other hand, a tenured professor has a permanent position as a faculty member. However, some faculty members are not completely convinced of the effectivity of the faculty evaluation. Filipino professor Dr. Roberto Ampil said the evaluation does not fully determine a teacher’s efficiency to teach a subject matter because there are students who do not take it seriously or there are some who give low grades because of disinterestedness in the course. Citing academic freedom, Ampil said a teacher should not be dictated on how to handle his or her classes. “Hindi ibang tao [ang] magsasabi sa’yo kung anong dapat gawin mo, kasi no matter na gaano kaganda ‘yung sinasabi nila, pag in-apply mo na, hindi mo rin magagawa. So talagang ikaw pa ring teacher, kapag ando’n ka na, nakalublob ka na do’n, ito ‘yung klase ng estudyante mo, so i-a-apply mo ‘yung sarili mong strategy,” he said. Moreover, the evaluation does not really say much about teachers’ performances because of students’ “random comments,” Dr. Paolo Bolanos, chairman of the Department of Philosophy, said. “Sometimes the concerns are not even related to the course content, or the specific pedagogical style of the faculty. Minsan napaka-personal, napaka-subjective,” he added. as students. We can give the lowest score on the [evaluation] sheet, leave criticisms on their teaching method, and still see them going around and teaching in AB with little to no change whatsoever,” he said. “Ako, I’m just handling two or three subjects, malalaman mo kung sino ‘yung estudyanteng ‘yun… Dahil inaaral mo naman, kilala mo ‘yung estudyante, papaano ‘yung style ng pagsusulat, ganiyan,” she said. The names and sections of student evaluators are not shown in the overall results that are given by the department chairs to the teachers. This gives the students protection from possibly being targeted by professors in class and makes the evaluation more effective as they are given the confidence to be honest in raising concerns on their professors or instructors. However, there are cases where professors do not take the comments well and get back at their classes, questioning the evaluation result they got. But how could teachers know who wrote the comments and gave the scores if students’ identities are really kept hidden? This has something to do with teachers’ memory retention, Placido explained. Because they know their classes, they can sometimes recall a student or a section along with an incident or something that they did which could be reflected in the comments. Laparan echoed this, saying students are really anonymous but there are hints in the comments that reveal which section they come from or who they are. “The way they write, the way they phrase their sentences, ‘yung mga jejemon magsalita, alam ko kung sino,” he said. This is also the case for some teachers with only a few loads, like Filipino professor Dr. Imelda De Castro, because they are more likely to remember their students. manage to produce. A few days after the campaign period started in February, a video of two ladies from San Fernando, Pampanga went viral after one of the women said she will vote for a certain politician accused of plunder simply because “guwapo siya at mabait.” It is almost laughable to witness the campaign period transition from a time of critical decision-making in choosing the next roster of legislators into the contest of looks and overnight virality it has become. Filipinos are now the panel of judges, and it has become a competition on who presents the best runway look and who shakes the most hands in the audience. words. The former Salinggawi Dance Troupe captain used to participate in cheerdance competitions for the tiger university, but since bagging his diploma, he found himself focusing more on a much bigger fight: a fight to let people know the harsh reality of life, which he faces through writing. “Nabuhay ako sa cheerleading; ‘yun ang bumuhay sa akin. Pero for me, tapos na ako sa phase na ‘yun. May mas [malaki] na ako na kalaban, may iba na akong ipinaglalaban,” he says. As a cheerleader from high school up to college, Benjo, who used to juggle his priorities and responsibilities for both his academics and extracurriculars, has entered into the world of creative writing and uses his words to create an impact on his readers. Venturing into his chosen path, the writer assumes the role of a messenger to show the situation of society and convey a message of action. Benjo believes that writing is a medium to tell other people’s stories and to present the world in a different perspective. “Wala kasing malaki o maliit na istorya, lahat ‘yan may ma-i-she-share na hindi mo alam, kailangan mo lang makinig. Tayo ‘yung nagiging way na iparating ang istorya nila. They need our help as writers,” the raconteur expresses. Coming from a destitute area in Taguig City, Benjo writes about his hometown and the challenges surrounding it. He writes for his community in the hopes of reaching out to the well-off members of society. “Kasi kung sila (mahihirap) pagbabasahin natin, siyempre ‘di nila babasahin ‘yan. ‘Kakain muna ako, kakayod muna ako, ba’t ko babasahin yan?’ [...] Ang merong oras niyan [ay] ‘yung mga nasa taas, sila ‘yung audience ko. Sila ‘yung gusto kong makatok para masabi na, ‘Uy, may ganito tayo. Anong gagawin mo as a Filipino citizen? As kababayan?’” he explains. Currently, the decorated writer is taking up his postgraduate studies in creative writing at the UST Graduate School and is continuously improving his skills through engaging in writing workshops. This April, he is set to take part in the UST National Writing Workshop, the 19th installment of the annual summer writing workshop of the Center for Creative Writing and Literary Studies, which will be happening in Baguio City. Excited yet nervous, Benjo believes that no matter how terrifying the workshop may seem, it will only help him understand the technicality of writing and apply it in his style. “‘Pag umupo kami doon, gigisahin ‘yung mga gawa namin isa-isa, pero siyempre ‘di tayo gagaling nang gano’n lang, nang wala tayong ginagawang steps [to improve] ourselves,” he adds. LITERAL school of fish that needs to be fed is ironically what awaits Tyrone Nepomuceno as he wakes up at three in the morning. After he has sprinkled enough food in their aquarium, the history instructor positions himself in front of the family altar to offer a little prayer. He then goes on to eat breakfast to fill up for an eventful day ahead. Soon after, the senior high school instructor waves goodbye to his number one supporter, his mom, as he steps out to go to work. “Her honesty and care for others influenced me as an educator and a person in general,” he shares. He takes the LRT, but upon arriving, a small part of Tyrone wishes he had just booked a ride instead because of the massive and unforgiving crowd at the station. This setback serves as a reminder for him to play his role efficiently, for society evidently still has a lot of room for improvement. “Sa pagtuturo ko, I should transform the lives of people—dapat makapag-produce ako ng mga tao na mas magaling sa’kin kasi ‘yun naman talaga ang teaching: dapat makapag-produce ako ng better versions of myself,” he says. pinapakita sa’yo ng bata, meron pala silang pinagdadaanan,” he shares. Marker in hand, Tyrone kickstarts his discussion about globalization by surveying what it means to his students. The lively class shared some insights that the energetic history instructor later incorporated into his lecture. He roams around the classroom jumping from one ideology to another, allowing the students to have a panoramic view of the lesson. Tyrone casually brings up some trivias and anecdotes which his students find to be entertaining. “Ang focus ko sa teaching, why and how. [‘Yung] who, what, when, it follows. In the first place, memorization is the lowest form of learning. Dapat understanding ang focus. And when you understand something, it follows that you memorized the important parts,” he stresses. After his morning class, Tyrone drops by the Simbahayan Community Development Office and brainstorms with other coordinators for upcoming projects. Aside from being a dedicated teacher, he is also the community development coordinator for the SHS department, striving for people empowerment and spiritual growth. As he explains the work of Simbahayan to his fellow coordinators, Tyrone cannot help but reminisce a moment in the community that struck his heart the most. He once prepared a pilgrimage for an underprivileged community when a mother came to him and burst into tears, touched by the gesture. “May mga ginagawa kaming projects na para sa amin, wala lang, pero for them, big deal. It makes me cry kasi na-realize ko na ang ganda ganda ng buhay natin,” he shares. Passion and dedication enveloped Tyrone as he referred to his continuous work for the community as his greatest achievement. He adds that the pinnacle of the knowledge he acquired as an Asian studies (bachelor’s) and history (master’s) graduate is reflected in his contributions to the community. “Nakikita ko talaga diyan ‘yung competence, compassion, and commitment. [...] Wala akong pakialam sa awards, sa degrees na nakuha ko kasi gusto ko lang naman do’n ‘yung learning. Siguro kahit nasa death bed na ako, ang huli kong maiisip na nagawa ko is community development,” he says. EYOND the pristine and lovely neighborhood of Blue Ridge B, Quezon City is a sanctuary for life-changing miracles: Maria Lena Buhay Memorial Foundation Inc., the country’s first oral school for the deaf. Every day, the foundation’s cherished schoolchildren with bright smiles and big ambitions are given a chance to experience the world better through a rekindling of their God-given gifts. Each day is another opportunity to maximize their potentials through the caring efforts of motivators who believe in and never give up on them. Heading the school is a teacher and a mother who embraces each child with love. Leticia Buhay talks with the students while noticeably enunciating every single word slowly. Whenever one child is unable to respond, the understanding mentor would smile and patiently repeat what she said in order to be understood. Leticia wakes up every day in anticipation to meet with the children who seek her genuine care and love. Instead of just thinking about herself, she tries to ease other families’ plights by blessing them with her gift: giving a voice to the voiceless. The foundation offers speech therapy to tend to the needs of the children. Through oral exercises, the kids slowly begin to manage minute utterances. Just like a bird watching her chicks fly, Leticia relishes in the sight of a child given an opportunity to grow and become the person he or she wishes to be. Her smile exudes patience and compassion that speaks louder than words. For more than three decades, Leticia has been running the foundation that has given a lot of deaf children a chance to talk and be heard. This is all thanks to her fascination with speech and love for children, specifically her late daughter, Lenlen. With a smile on her face, the caring mother’s eyes followed the students who reminded her of Maria Lena or Lenlen, who also had an encompassing love for deaf children. “She would go with me every time I see my patients here. We converted this into a small room first before the school. I would bring her with me because she was so interested in my work,” Leticia shares. Teacher Mom, as she is fondly called, remembers her daughter wanting to take up a speech therapy program after bagging a psychology degree, but in April 1986, tragedy struck the family when Lenlen succumbed to leukemia. It is something that money cannot pay for. It is something different that it is so very satisfying that no amount of money can pay for what you feel. I suppose I was meant for that: to help people with deficiency. “It became more meaningful that we open a school in her memory,” she says, reminiscing how her daughter would tell her about her hopes of opening her own school for the deaf and hard of hearing. paulit-ulit ‘yung mga sasabihin mo sa kanila,” Teacher Manet says. “Tapos ‘yung mga batang ito, visual din sila sa lipreading. Overall, patience talaga.” “Mas madaling magturo doon sa regular school. Siyempre, [ang] perception ng tao, bingi sila. Challenge ‘yung maturuan sila. Kung ‘yung hearing ‘yung naturuan mo at natuto, masaya ka, pero what more kung sa hearing-impaired? Iba ‘yung feeling,” Teacher Norman also shares. MIDST the line of foreign restaurants on the lavish road of Tomas Morato, an old houseturned-restaurant stands to prove the sublimity of panlasang Pinoy, which guests are bound to return to. Named after its own address, Limbaga 77 Cafe and Restaurant aims to cater to Filipinos with delectable Filipino dishes while maintaining its old house structure with modern interior to let guests feel at home—just like eating a meal in their grandmother’s house while on vacation. Sonny Fortuna established the cafe in December 2014 with the decision to go for Filipino food despite the swarming of foreign cuisines, because “we can never say we could eat them every day. We will always search for panlasang Pinoy,” he says. photos by SHANA ANGELA S. CERVANIA food business in Manila. The familyowned restaurant has been open for over 60 years and is still going strong. They offer a variety of Chinese food that has been somehow tweaked to suit the taste of Filipinos—and it truly does. Shantung Restaurant was the first to offer Hot and Sour Soup in Manila. It is served hot and contains murm, black vinegar, egg, and pork blood which perfectly suits those craving something warm for their tummies. Another specialty is their crunchy and juicy Fried Chicken, which will surely satisfy chicken lovers everywhere with each bite. Of course, what Asian celebration is complete without rice? Shantung offers their special signature Yang Chow Fried Rice that goes with everything. It is served with ham, egg, carrots, crab meat, peas, and shallots. It is definitely one for the books and worth every bite. For the dumpling lovers, get ready for their mouthwatering version of Steamed and Fried Dumplings, which are said to be “pot stickers” since they stick to the pot as they cook to perfection. One just has to pair it with the classic toyomansi combo and it is good to go! HERE must be an underlying meaning behind every craft in an art exhibition, whether it intends to apprise consciousness or to commemorate the idea of the artist. Artworks that are sketched and sculpted are frequently seen in art displays, but artists Rirkrit Tiravanija and Tomas Vu presented a different variation of art. In their collaborative performance and installation, Do We Dream Under The Same Sky, which was on display from Jan. 12 to Feb. 9 at The Drawing Room in Makati, the artists portrayed artistic revolution. Through texts and graffiti over photographs and silkscreen printing, the art show was unadorned yet honest and straightforward with its meaning. Attached to the gallery’s walls and floor are newspapers with graffiti that describe and detail the pieces on view. The audience is invited to observe the texts marked and challenge themselves with the conceptualism of the artistic movement. The room creates an alternative space for the visitors to interpret and contemplate on the phrases that were inspired by the opposition during the Mexican-American War in the years 1846 to 1848. The art show centered on the concept of “gringo,” an expression used by Latin Americans to refer to people from other countries, especially the United States and Britain. The interpretation of the word “gringo” varies. It is believed to have originated from the phrase “Green Go Home!” because the American soldiers wore green coats and were aiming to invade the land. Another folk etymology of the term is said to be derived from Mexico, when the American troops sang songs beginning with words “Green Grows…” such as Green Grow the Lilacs and Green Grow the Rushes, O. Moreover, the word also refers to someone who does not speak Spanish or is out of touch with Latin culture. A series of newspapers with graffiti in a huge speech balloon catches the viewers’ attention for its plain form but complex delineation of the phrases imprinted on each newspaper. Phrases such as “The days of this society is numbered,” “The infamous product of Western culture,” and “We don’t mix” were left for the crowd to ponder on. The artists were encouraged by social phenomena and inclined to produce a craft about what concerns society the most. A GITNA ng giyera sa pagitan ng buhay at kamatayan, pinipilit niyang angkinin ang payak na liwanag na dumadalisay sa bintana ng kaniyang mga mata, sapagkat malingat lamang siya sa bukana ng dilim ay lalamunin nito ang munting kislap ng buhay na pumipintig sa kaniyang sinapupunan. Pumutok ang kaniyang panubigan. Umagos ang likido sa kaniyang mga hita pababa hanggang magporma itong tila salamin sa sahig; doon nga ay nakita niya ang repleksiyon ng isang babaeng walang pagsidlan ang kaba at tuwa sa nalalapit nilang pagkikita ng kaniyang unang supling. Nakabibingi. Bumabakas ang mga litid sa kaniyang leeg na kumikinang sa tuwing aagos dito ang pinaghalong luha at pawis. Ang pagtirik ng kaniyang mga mata at buntong hininga ay mga pahiwatig ng kirot na imposibleng maisalaysay ng anumang salita. Bumulahaw ang marami pang sigaw at sa kumpas ng kaniyang kamao ay sumilay ang munting mukha na tila isang talulot na dumulas. Sa wakas, ang sigaw ng paghihirap ay napalitan ng mapayapang pagtangis: isang iyak ng musmos, larawan ng isang bagong buhay. Ngunit hindi tulad ng ibang mga bata, mayroong espesiyal na pangangailangan ang kaniyang anak: pagkalingang tila hindi niya kayang ibigay. Hindi niya ito inaasahan, at hindi niya ito matanggap. Habang lumalaki ay batid ng lahat ang paglabas ng mga kakaibang katangian ng bata. Hirap na hirap ito sa kaniyang pagsasalita; madalas ay mga huni lamang ang kaya niyang iparating. Kung hindi mapagbibigyan sa kaniyang kagustuhan ay magwawala ito nang walang humpay. Upang maiwasang masaktan ang sarili, binabalot siya gamit ang isang comforter hanggang sa siya ay kumalma. Kinakailangan din siyang bantayan tuwing nakikipaglaro sa ibang bata, sapagkat minsan ay nagiging bayolente ito. Higit sa lahat, tahasang mababanaag sa pisikal na aniyo ng bata ang kaniyang pagiging espesiyal. Sa mga panahong dinadalaw ng sumpong ang bata ay nasa malayo ang kaniyang ina. Tahimik itong nagmamasid. Ngunit sa kaniyang mga mata ay batid ang lungkot, pagkadismaya, at kung minsan ay matinding poot. Hello, how was your day? The day was not as good, unlike yesterday. How are you, little one? I’m fine but I have this friend— he moves like he’s being chased. Being chased by what? By ghosts or demons, I do not know, you take a guess. I will never know, so tell me what frightens him. I cannot see what he sees at night, I do not understand what he speaks of: shadows that follow his every step and monsters that haunt him when he goes to bed. Your friend sounds familiar. Similar to a boy I encountered, a boy I loved when I was younger. Was he your friend too? Did you hang out at school, and eat snacks before noon? He was, maybe even more. The luster in his eyes was bright and his hands were pale, but his scars deepened when night came. strangers,but to him it was a different picture. Sometimes, I wish I understood his pain.